The client is a reputed French men's apparel manufacturer. The clientowns and operates a CMT (Cut, Make, Trim) factory, specializing in t-shirt garment construction. Their capabilities range from basic t-shirts to luxury fashion apparel. 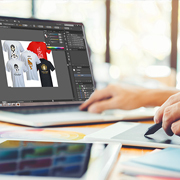 The client had a high volume of t-shirt design templates and required illustrations for individual t-shirt elements (sleeve, collar, back, neck, etc.). Creating accurate illustration replicas of template designs on each t-shirt element. The client transferred the template designs and one t-shirt image (JPEG format) during the trial via email. O2I assigned one full-time resource to complete the task within two business days. The process involved tracing the design, recreating with Adobe Illustrator, converting to EPS and PDF file formats and uploading via Dropbox. The client signed a full-time contract to outsource 200 images, and O2I designated two full-time resources to handle the project. Four images were delivered per day via Dropbox in the required EPS and PDF formats. If you require high-quality graphic design services including illustrations, artwork, business card design, logo design, animation, Photo editing, video editing, and more, call or email today. We will revert within one business day with a free quote. Alternatively, opt for a free quality test (trial).